Tiffany knows how to write her name using uppercase letters but not with lowercase. I was almost certain that she could identify lowercase but to be sure I decided to put together this simple activity. I taped the contact paper to the wall but you could attach it to anything such as an easel, table, etc. 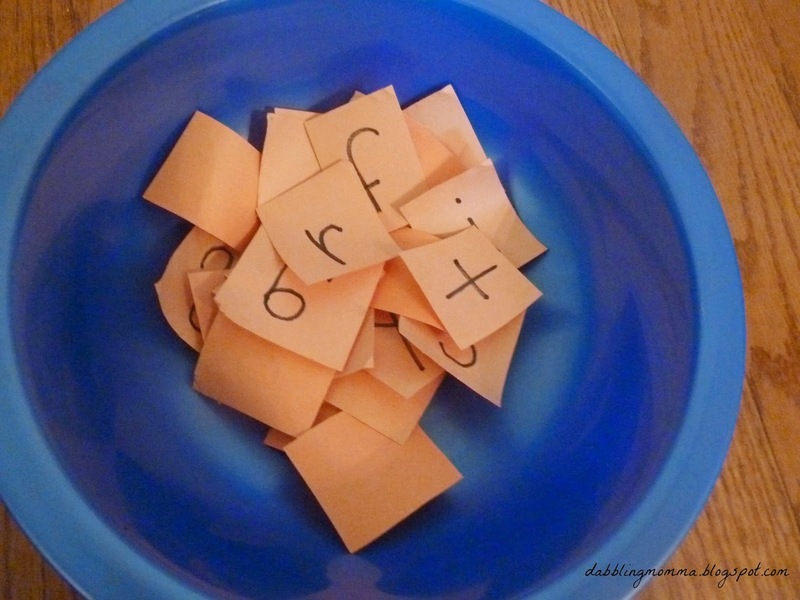 Next, I stuck the foam letters to the contact paper and finally cut the construction paper into squares and wrote the lowercase letters onto them and added them to a bowl. My daughter picked out a letter randomly which I liked because I did not want her to go in order of the alphabet. 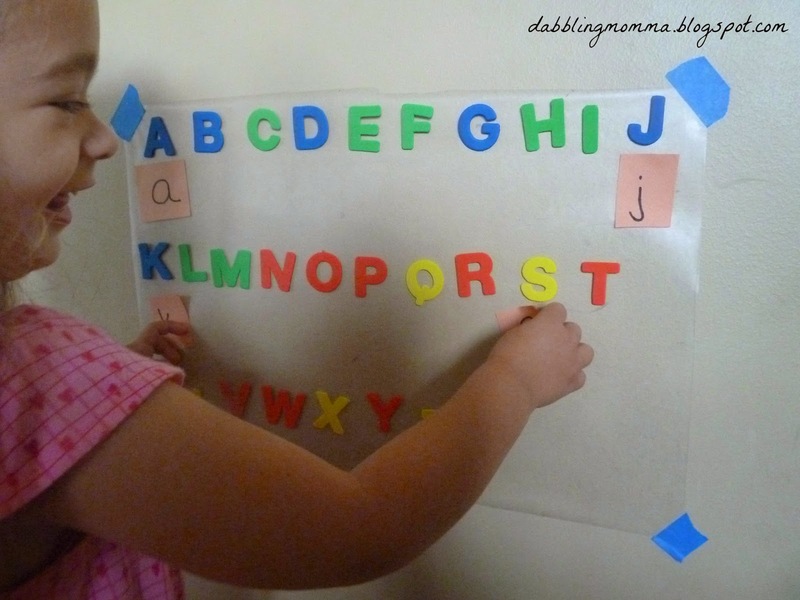 After picking a lowercase letter Tiffany had to find the matching uppercase letter and stick it to the contact paper. Happy face while playing our matching game! And I am a proud Mommy, Tiffany matched every letter correctly!! To top it off once finished she asked to play again!! I love this. We Have switched to working with just lowercase letters lately, but I have not combined the two yet. I think will soon though, just to see if she knows they're the same. We're going to be playing your game. Natasha, I would like for my daughter to focus more on lower case. I am glad she can tell the difference but she's writing in upper case only (her name) and I'd like her to start writing it in lowercase. Let me know how the game works for ya!! Great idea! I need to do this as well. We have primarily been working on Upper case and this would be good to combine both. us too Angel and I really want my daughter to get comfortable with lowercase. Yes! This is brilliant. My daughter's right at this stage, too! Thanks, Laura!! I'm loving seeing how they pick up things at this age! Once again, you nailed it!! 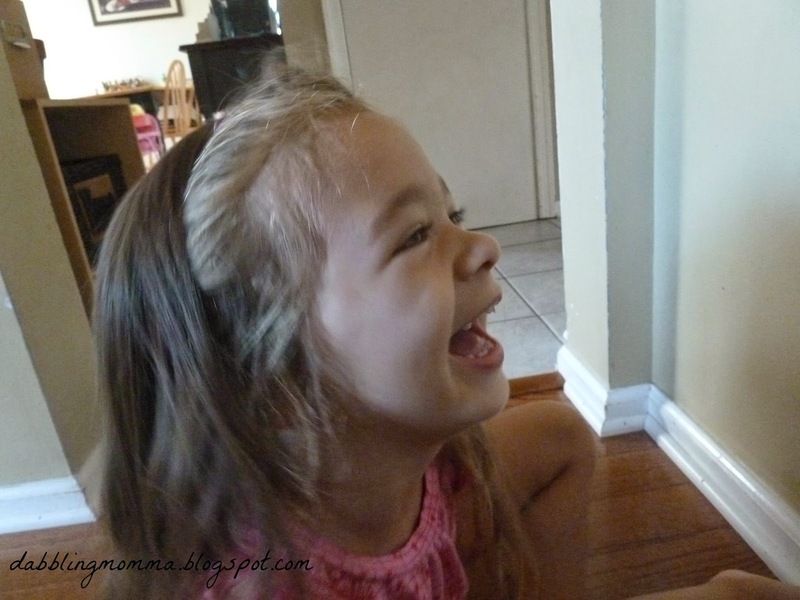 I can't wait to try this with my preschooler! Thanks, Yuliya! The best part was that my daughter had so much fun with it! So glad you'll try with your daughter Adanna! I hope she has fun with it! 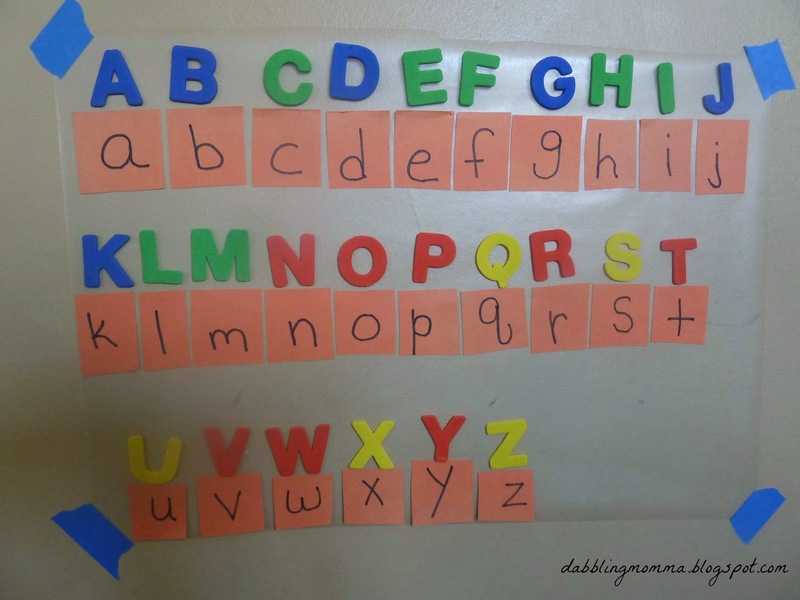 Such a simple yet fun way to learn letters, I love it! This is a great idea for getting that recognition, must try it with my two now. Thanks so much for linking up to the Parenting Pin in Party this week, really appreciated. Thanks, Helen! I hope your kids have fun with it too!! Such a great idea! I have a fridge door full of magnet and not though of that! Thanks for sharing it with us. #pintorials. Thanks, Katie! I will definitely be back each week, love your linky!! Thank you! It was such a fun activity, learn while having fun! !